Let Focal Point Landscape Maintenance add value to your backyard with a quality AstroTurf installation on the Gold Coast. We use only premium-grade AstroTurf products to ensure your artificial turf not only looks great, but stands the test of time. 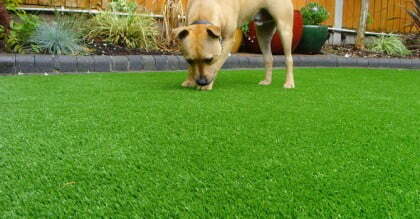 AstroTurf will make a great addition to your home, office or commercial building. We can install AstroTurf in your pool area, front yard, play areas or anywhere you want high-quality artificial turf at an affordable price. We can have even create your very own putting green. We provide fast, efficient & affordable AstroTurf installations! Stop wasting your weekends mowing your backyard! Our AstroTurf looks just like the real thing, but requires little-to-no maintenance. Our Gold Coast Astroturf installation professionals will measure, quote, supply and fit your artificial turf. Gold Coast AstroTurf installations are great for the environment because there’s no water needed to keep your turf green and there’s no need for harmful garden pest control poisons and chemicals. You can have green grass all year round! It’s a common misconception that AstroTurf is more expensive than organic turf. You should consider the slightly higher installation cost as an investment, because you will save a lot more cash in the long run on maintenance costs like mowing, snipping, fertilising and more! Looking to have AstroTurf installed on the Gold Coast, Tweed Coast or any surrounding areas? Call Focal Point Landscape Maintenance on 0431 887 544 or request a quote online.